I know, it may seem strange, but also in the antique dealers ‘world there are objects that, all of a sudden, everybody wants and collects, often without a good reason for doing it. 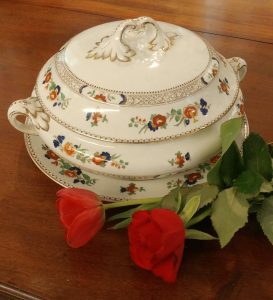 The traditional vegetable tureen dates back to the Medieval Ages, when dishes got covered with a metal dome, to keep food warm and to prevent it from being poisoned. They exist in different materials: in silver, in Sheffield plate, in porcelain, in earthenware and sometimes they come with a supporting plate. In England, it became popular at the beginning of the XIX century and since then, no table could do without it in one of their many shapes and colours. In my shop, I have a table where I exhibit the vegetable tureen both in ceramic and in porcelain, one close to the other without any specific criteria, but for the pleasure of seeing them together, that always seems to stir people’s approval and interest. I think their success comes from the fact that they are colourful, happy objects, that may be set without big qualms on a shelf, in the kitchen or, when in need, used. They are beautiful to see, from any perspective and they show off nicely on a coffee table in the sitting room with some candies and chocolates, or on a display console along a corridor or at the house entrance and used as empty-pockets. In recent times I have seen them used as flower bowls, with their lids leaning on the side, or on a dishes support, used as background for a flower arrangement. Their commercial value is often rather modest, so that to stimulate the most creative uses and matchings. They are so nice to be placed on a table, ready to keep your dainties warm and tasty. They are so different from one other, to easily satisfy my clients’ different tastes. 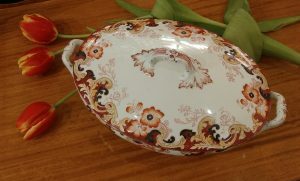 For those with a classic fancy, there are some beautiful blue and white covered dishes, with a Willow pattern, or there are some other with unusual, hexagonal, squared shape, while for the vintage lovers, there are some with minimalist shapes, with small handles and tops and geometrical and stylized design. In this period my favourite one is a ceramic Victorian vegetable tureen, with its classical oval shape and its squared handles. 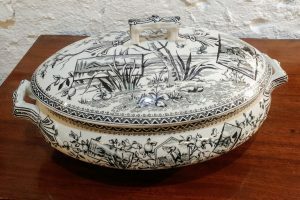 It has no printed mark, so I am not able to retrace its manufacturer, but it was surely made in Staffordshire, that was, at that time, the main British porcelain and ceramic production centre. I believe its décor is wonderful: a monochrome in black that stands out from its white background, making it both elegant and rustic at the same time. Every section is rich in details and every time I look at it I detect something new. A typical example of “aesthetic style “, that was very trendy towards the end of the 19th century, where perfectly reproduced fruits and flowers are mixed with landscapes inserted into small frames; where fans and other orientally inspired themes, are mixed together with exotic animals or less exotic ones, like butterflies. The handles themselves are enriched with geometrical décors, that recall to mind the relief décor of silver covered dishes. Even edges are not neglected, embellished, as they are with a nice Greek fret. That’s my covered vegetable dish.